Over a distinguished career, Larry Bell has made an extraordinary contribution to British Columbia. He has advised and participated in the creation of public policy and the reshaping of government, he has provided strong leadership to service organizations and critical public institutions, and he has contributed to his province as a volunteer. Mr. Bell has served several times as a deputy minister for British Columbia’s government, and has provided outstanding leadership as chair and CEO of B.C. Hydro. As board chair, he leads that corporation with the same vigour as when he joined B.C. Hydro nearly 20 years ago. 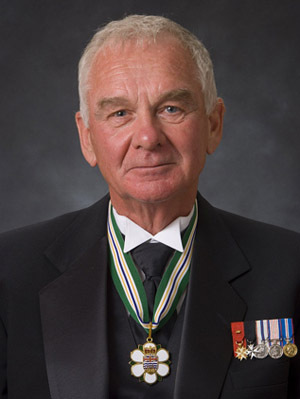 He served on the board of governors of the University of British Columbia, including four years as chair. Mr. Bell also served on the boards of the Canadian Chamber of Commerce, Vancouver Board of Trade, the Conference Board of Canada, and a variety of corporations. He has been chair, president or CEO of several of these. Mr. Bell has also served with distinction in a variety of volunteer positions, including on the boards of Vancouver Hospital Foundation and the B.C. Transplant Society Board of Trustees, and acted as general campaign chair for the United Way of the Lower Mainland. Mr. Bell has been recognized with a number of honours for his contributions. He is a passionate, energetic and rigorous agent of change and transformation, always motivated by the broader interests of British Columbia and Canada.